Marble is a natural material which although hard wearing can easily be ruined by a strong chemical such as acid. 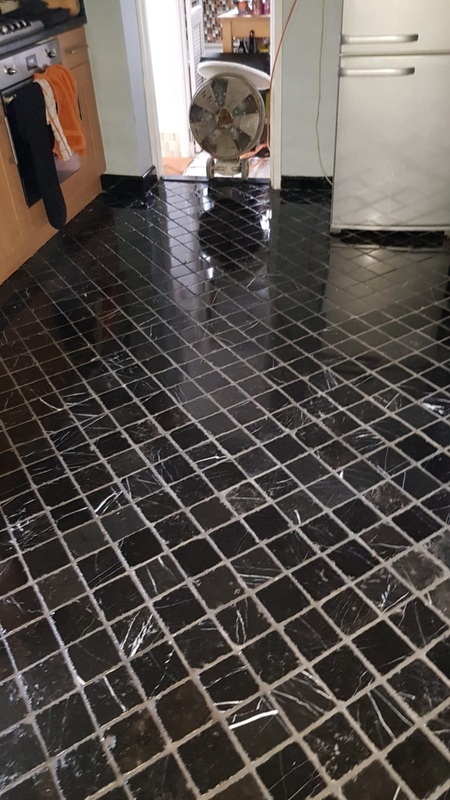 In this case my client’s kitchen floor which was laid with black Marble square tiles was etched due to the accidental spill of a corrosive agent and the subsequent attempt to clean it up. The property was in the historic city of Winchester and as you can image my client was horrified by the state of their Marble floor which was now ruined. Desperate for a solution that didn’t involve the expensive tiles being replaced we were asked to take a look. After surveying the floor, I recommended resurfacing the stone with a set of diamond encrusted floor burnishing pads which would remove the etching and hone the stone back to its original appearance. Happy to discover there was a solution to the problem we were given instructions to go ahead with the restoration. Our first task was to remove the kickboards from underneath the kitchen units, this ensures they are not scratched during the cleaning process and it also allows our buffer machine to get right to the edge of the floor. I then started the burnishing process by applying a 400-grit coarse burnishing pad lubricated with a little water to the floor. This coarse pad will remove the etching and dirt from the Marble. It does generate a fine slurry on the floor so after each pad it’s best to rinse the slurry away with water and then extract it off the floor using a wet vacuum. Following this, I worked my way through the remaining burnishing pads repeating the process with 800-grit medium and 1500-grit fine grit burnishing pads. I also used some small hand-held burnishing blocks in the difficult to reach corners and edges. The floor pads struggle to reach into the recesses of the grout lines so halfway through the burnishing process I stopped to apply a dilution of Tile Doctor Pro-Clean along the grout lines and give them a scrub with stiff hand brushes repeating the process in stubborn areas. After a final rinse the floor was left to dry off overnight. The next day I finished the polishing process by applying the last of the four pads in the set which is a very fine 3000-grit pad which refines the polish even further. 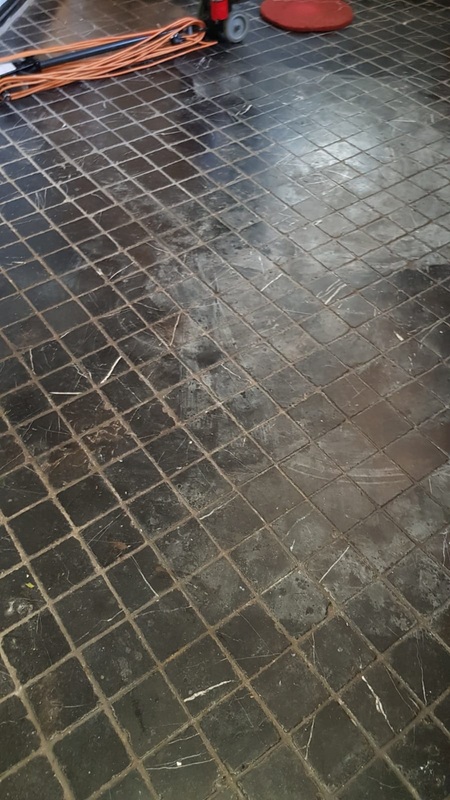 This last pad is applied dry with only a little water sprayed onto the floor using a technique we call a ‘Spray Burnish”. The one of the advantages of this method is it leaves the floor dry so is ready for sealing. Now that the appearance of the Marble had been restored it was time to protect the stone against future dirt, stains and damage by applying a sealer. On this occasion I chose Tile Doctor Colour Grow which is a colour enhancing product that really improves the depth of the black Marble tiles and increases the contrast with the white veins in the stone. Two coats of Colour Grow were applied allowing time for each coat to dry in-between coats. Once the sealant had hardened, I ran over the floor with a white buffing pad to further enhance the look of the Marble floor. The Marble tile and grout was completely transformed much to the relief of the owner. 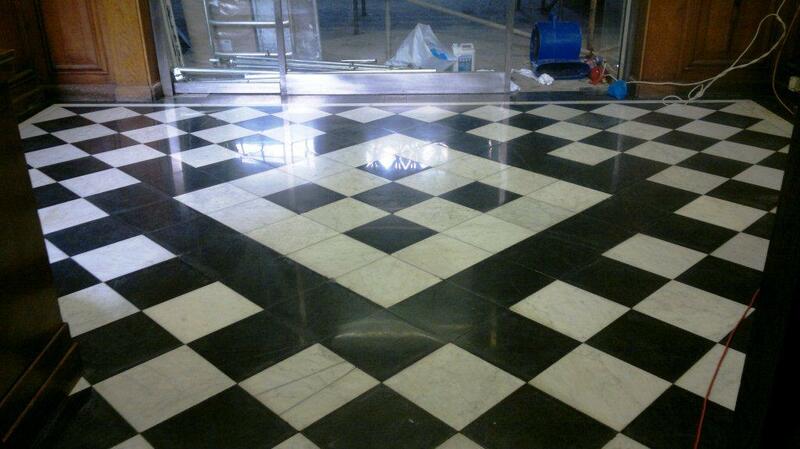 Photographs below of a classic black and white Marble floor tile installation at premises in the city of Winchester. 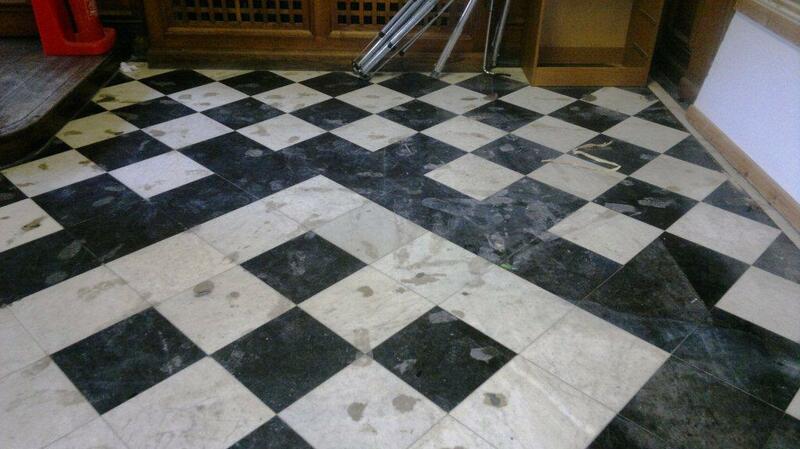 As you can see these Marble tiles had seen some traffic and were not in the best of condition following on from some building work that had been going on; fortunately we are quite used to dealing with these problem and have just the right products and equipment to restore them. For best results on hard stone surfaces such as Marble we burnish the floor using a set of diamond encrusted polishing pads. You start with a coarse pad which applied with a little water to remove surface dirt and sealers etc. before moving through a set of finer polishing pads until you reach a high shine glossy finish. Half way through the burnishing process we stopped to apply a dilution of Tile Doctor Pro-Clean along the grout lines and give them a scrub with stiff hand brushes repeating the process in stubborn areas. After the treatment the floor was washed do to remove any soiled solution before being buffed with a white buffing pad. Any trace of its previous condition was now gone and the floor was uniform in appearance, it took much of the day to do the polishing and a set of four burnishing pads to acquire the right lustre. Professional service, thank you – our terracotta tiles have been given a new lease of life and look so much better! Charles colleague was excellent. He did exactly what he was asked to do. Our en-suite shower tiles were very badly stained and he restored them better than we thought possible. Over the moon with Tile Doctor! They have transformed our bathroom back to its former glory, thank you and we will be recommending you in future. He was very friendly and professional and there was zero pressure to use him or his services. He showed me photos from another similar job so I knew what to expect, measured up and took me through the process. As I was happy with everything I asked to proceed and I was contacted the next day to arrange for a convenient time to do a trial patch test to make sure we were happy with the results. The trial looked good so we decided to proceed and the tiles were cleaned of the old sealant that day. Charles then returned the following working day to put on the new sealant and finally we have our tiles back. I wish we’d gone straight to tile doctor from the start and saved ourselves a year of hard work, expense and issues. 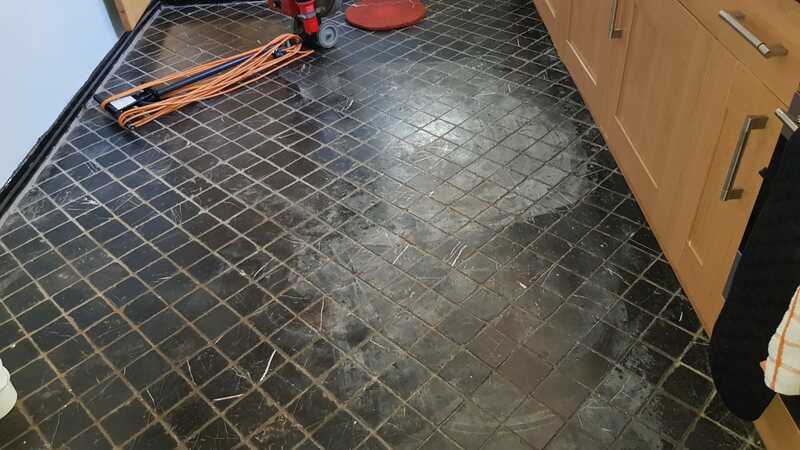 Our black limestone floor has been down for 8 years, despite being laid well we were wrongly advised to leave it unsealed after laying as the tiler didn’t think it was necessary. It became very scuffed and mar. . . ed so after 4 years we had it cleaned and sealed by a tiler. The result was ok but I was never entirely happy with it. Another 4 years passed we decided to contact The Tile Doctor. I’m a very fussy person, as I think Charles and Stuart would agree with, I can honestly say my floor has never looked so good, I didn’t realise the tiles could look so beautiful, they look far better than they did when we bought them. I’ve even decided to contact the company I purchased them from to tell them and show them the photographs. It’s incredible what results can be obtained with the correct products, equipment and knowledge. Well done Stuart (and Charles). Work was carried out within 48 hours of initial enquiry as we were in a hurry. Although our old quarry tiles turned out to have concrete rather than conventional grouping, meaning they did not come up as clean as we had hoped, the operative did a great job of removing the surplus mix solidified around the edges of many of the old tiles so that the floor looked much better overall and especially once the polish and final cleaning process was completed. We were really pleased and impressed by the care and trouble taken to do the best job possible.